Wolf gas cooktops in 15-, 30- and 36-inch sizes have a similar overall design that features porcelain and stainless steel parts, sealed burners, a control panel and knobs. Wolf has designed the cooktop and parts for quick disassembly and cleaning. As a result, you can clean any size Wolf gas cooktop using similar methods without any specialized cleaning tools or methods except to remove oils and grease and/or polish stainless steel areas. 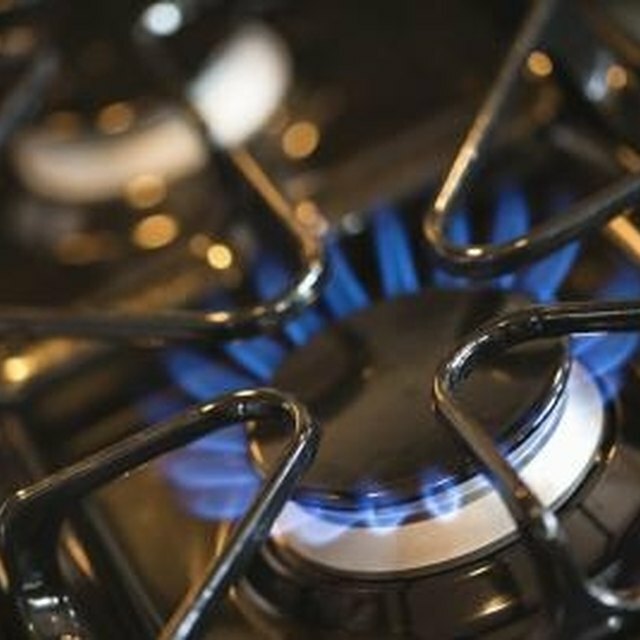 Turn off your Wolf gas cooktop burners and wait for the cooktop to cool completely before cleaning. Fill a sink with hot water and enough mild detergent to make the water soapy. Place a lint-free microfiber cloth and a non-abrasive scrubbing pad in the water. Lift the burner grates and caps carefully from the burner pan and set the pieces aside on a countertop. Slide the edge of a dry microfiber cloth under the first control knob, lift the sides of the cloth up to dislodge the knob from the cooktop and set it aside. Repeat with the other knobs. Wipe the burner pan clean with your soapy microfiber cloth. If you're dealing with hard-to-remove stains, apply soapy water to the stains, wait 10 minutes for the stain to break down and then wipe it away. If necessary, scrub the stain away gently with a non-abrasive scrubbing pad. Rinse the pan with a damp cloth and wipe it dry. Spray a degreasing agent onto a dry microfiber cloth and wipe the control panel to remove oil splatter, grease, smudges and fingerprints. Place the first burner grate into the sink of soapy water and wash it with a cloth. Scrub away stains from the grates gently with the non-abrasive scrubbing pad. Place the grate under running tap water to rinse away residues. Wipe the grate dry as much as possible and then set it aside to air-dry. Repeat the cleaning process with the other grates. Clean each burner cap and knob with a fresh soapy cloth. Rinse the caps under running water and wipe dry. Rinse the knobs with a damp cloth and wipe dry. Apply a stainless steel polish to a cloth and rub the cooktop trim and exterior -- in the direction of the grain -- to polish the surfaces. Buff with a dry cloth. Return the parts to your cooktop after the parts have completely dried. Turn each knob on confirm that the burners still work. Turn off the burners. To remove a tough stain, sprinkle baking soda on the stain, apply a few drops of water to the baking soda and stain and wait 10 minutes. Scrub the baking soda into the stained area gently with your non-abrasive scrubbing pad. When finished, wipe the debris away with a damp cloth and wipe dry. To remove hard water spots, mix 1 part white vinegar with 2 parts water in a spray bottle. Spray the solution on a clean, lint-free cloth and wipe the spots away with the damp cloth. To reduce future cleaning, wipe up a spill as soon as possible after it happens. Never use harsh chemicals or abrasives. Never soak the knobs in water or scrub the knobs with any type of abrasive. Don't expose the spark igniters to water. Spraying degreasing agent directly onto the control panel or valves instead of a cloth can result in permanent damage to either part.